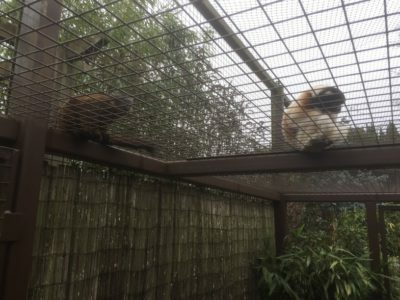 Our guest blogger today is Liam Catchpole, a volunteer at the Cotswold Wildlife Park & Gardens, who shares his amazing experience working with lemurs. 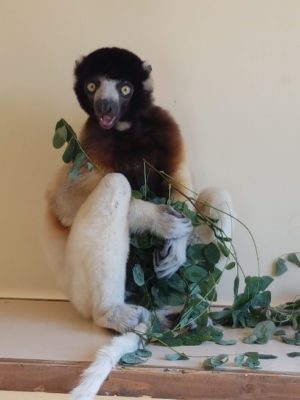 This is his second blogpost for the LCN and today’s focus is on the endangered Crowned Sifaka. 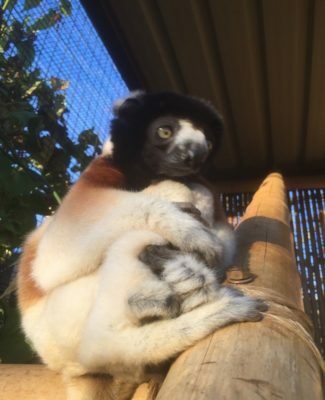 In this blog I would like to talk about the Endangered Crowned Sifaka. 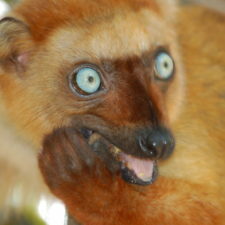 This specie of Sifaka are easily recognisable by their creamy white body, golden brown chests and black crown of fur. They spend most of their time eating and resting, depending on the season and they like to spend time in the very tops of trees. They usually come down to the ground to move between larger clearings to get to other areas of the forest. The Sifaka use their long, springy hind legs to leap between trees and skip across the ground in a bipedal fashion. In the last 52 years it has been recorded that their population has declined by 50% due to deforestation and for bush meat. Sadly, the Crowned Sifaka is expected to be up-listed to Critically Endangered in the very near future. 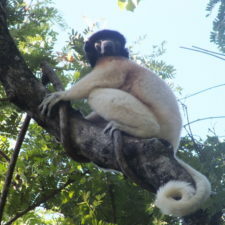 The Crowned Sifaka are endemic to north-western Madagascar in mangrove and dry deciduous forest. 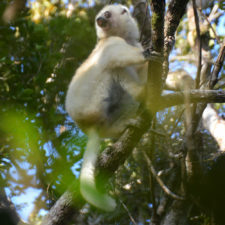 The last International Union for Conservation of Nature (IUCN) report commented that some Sifaka have been spotted moving towards the north eastern forest. Let’s hope they manage to find their way to the protected areas of Marojejy or Masoala. I hope we get confirmation of this on the next IUCN report. The Cotswold Wildlife Park & Gardens are only one of two Zoological collections in the UK to hold this species. In December 2016, they were proud to have had a successful birth of a male youngster names Yousstwo. Unfortunately, the parks female Tahina passed away in July 2018. Yousstwo was fully independent by that time and remains at the park with his father Bafana who get on really well. Bafana and Yousstwo are kept separately from the walkthrough so I don’t have any responsibilities when it comes to their husbandry and care but spend time observing them when I can. Last summer, when I arrived at the park prior to opening both animals were outside enjoying the weather and Yousstwo and I would have a quick game of hide and seek. 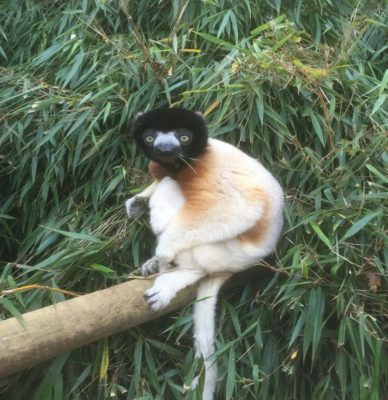 This handsome Crowned Sifaka is one of many of my favourite Lemurs at the park, let me introduce you to Maitso. Maitso was born on January 11th 2013 at Apenheul Primate Park in Holland. In my personal opinion I think he is the king of the walkthrough. Birdie the baby Collared Lemur loves to play with him especially with his tail. He does give Birdie a cue when he has had enough, a little chatter usually does the trick. Maitso is very curious. We often see him on the tallest branch looking over into the car park spying on all our guests as they arrive. He often has a couple of Ring-tailed Lemurs that will sit with him and engage in some allo-grooming. When Maitso arrived he was obviously excited to explore his new surroundings and was very interested in our visitors as they walked through the exhibit. He’s a friendly animal and would often follow people around which lead to him spending time by the entrance and exit doors. This is where I and my fellow volunteers come in. 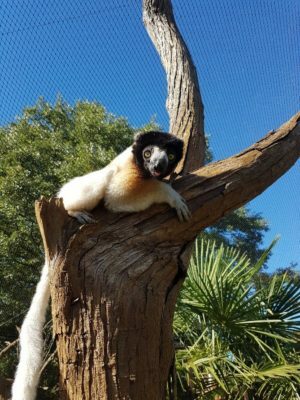 We make sure everyone is obeying the one door open at a time rule and the keepers are always around to help usher a curious Lemur away if they get a little too curious. I think Maitso was testing to see if the volunteers were up to the job. 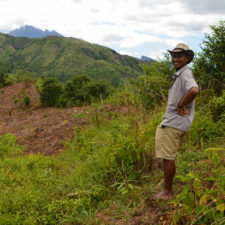 After a couple of weeks, he soon lost interest and now happily entertains himself with over 20 variety of plant species to forage on, as well as his fellow Lemurs to engage with. Now that he’s found his feet in the walkthrough, it’s a pleasure just to watch him. Maitso always knows when it’s closing time and will follow me up and down the walkthrough waiting for the keepers to arrive with his dinner. Often after he’s been let inside the house he’ll sit by his window looking outside. Birdie will often creep up behind Maitso, tag him and run away. Join me next time on tales of a lemur’s apprentice where I will be talking about the dangers the lemurs face and also I will talk about the loudest lemurs at the Park. 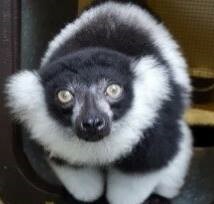 The Belted Black and White Ruffed Lemurs. Here is Maitso sticking his tongue out in one of his favourite spots. In the walkthrough there is all kinds of vegetation for the lemurs to enjoy during the day. 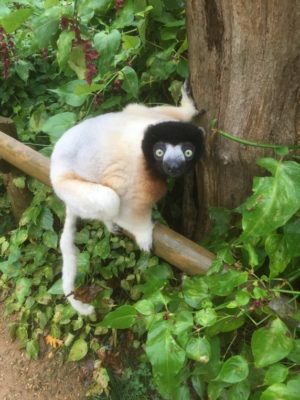 Want to support the crowned sifaka? Support these NGOs that works with specie!